Want to improve your English grammar? You can pick from these amazing grammar tutorials or pick a good grammar book from your county library. However, there are also other alternatives to learn using your Android phone. These days, apps are shaping the way we go about our ways in life. They help us store our music, teach us how to cook, exercise, keep us track of our schedule and also help us learn a new language or perfect it. In this case, we will look into some of the most common apps to help us perfect our grasp of English. This is especially helpful to ESL students. You don’t need us to tell you that learning a second language is really hard. If you own an iPhone you want to check out our list of English grammar apps on iOS. 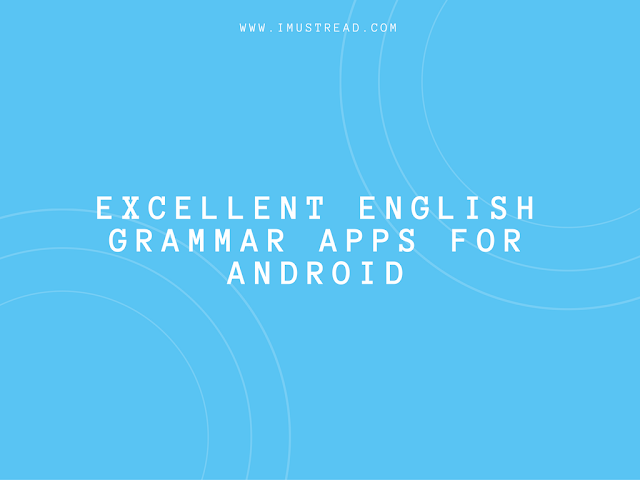 Given below are some of the most common English learning apps available for Android users. Duolingo is one of the newest and addictive apps for learning a new language. You will be able to earn points for every correct answer you get. You can time yourself for each of those tests and then level up. Each of the lessons in this app includes a range of listening, speaking, translating, and multiple choice challenges. You can see which of the answers you get correct. If there is one you did not get right, then the app will show you where you went wrong and how you can improve. The app can help you keep track of how many days you spend learning a new language. For every wrong answer, you get, you lose a heart. If you lose all of your hearts, you must restart the whole lesson again. Rosetta Stone’s mandate is to create the world where everyone can speak, read and write with confidence. With that in mind, RS gives you the privilege to learn a dozen languages such as German, Italian, Spanish and English. It is fully immersive and fun at the same time. You get to match words and images in a way that is similar to how you learned your first language – that too without the need to translate. This makes the process less stressful. There are several video tutorial lessons that include native speakers and online chats with fellow learners whom you can exchange new words with. This app was a nominee for the 2014 Best Education App award. You can literally learn English on the fly with it. It is a huge favorite for new and pro speakers. It includes 1000 questions, 750 flashcards, over a 100 small learning games, grammar articles, and feedback on questions. Memorize all of the concepts on flashcards and then test yourself with quizzes right away. FluentU makes learning a new language fun with the use of real-world videos. There are music videos, music videos, news and inspirational videos are all there for you. It caters to users of several interests and skill levels. Each of these videos consists of translated captions that include in-context definition and examples. You can also pause the videos and slowly take in the captions if it’s going too fast for you. You can attempt quizzes with the use of real-world videos. The experience is rich and organic that will get you to pick up new words in a quick and engaging manner. Have you ever thought about learning and laughing at the same time? Well, Memrise has just the recipe for you. It is absolutely free and includes over 300,000 courses for your language learning needs. Learn from over 200 languages including English. Memrise will adapt to your learning pace and style. Why not make it more fun? Get your friends to join in and compete to see if you can beat them using the words that you picked up with this app. You can also create your own courses with the use of rich multimedia cards. As the title of the app indicates, you will be able to listen and speak English more fluently. There are several lessons included in this app catering to students from elementary to advanced level. You can learn both online and offline. The app includes hundreds of audio files that include stories and conversations. You will also learn common idioms, phrasal verbs, the pronunciation of verbs, phrases and more. There are games such as Word Chain, Vocabulary and Sentence Building. Lingua.ly allows you to choose the language, words, and text to match your interests and life. In other words, you can learn English at your own pace that is quick and comfortable for you. Aside from learning the words prepared for you, you can also make your own courses. The memory games are one of the biggest highlights of this game. It is fun and uses and adaptive learning pattern that prevent you from forgetting the new words you pick up. Browse around real-world magazines and newspapers to perfect your hold on English. You can even keep track of your points. With this app, you no longer have to attend classes to learn a new language. You can just as easily study from the screens of your computer, tablet or phone. Many of the lessons that you will get are actually based on conversations from the real world. Make use of the brand’s full-featured tablet that works just like a regular textbook and more. You can either study by yourself or with a tutor so that you can get real actual feedback on your progress. This app is a recipient of Google’s Editor’s Choice award and was one of the best new apps of 2015 on Google Play. You don’t just learn new languages, but you can also learn to love them as well. Get assistance from over 60 million international native speakers who can make your learning effective and fast. Speaking Pal is an interactive app that enables you to learn English while speaking to a video character from the screen of your phone or desktop. Engage in short and fun dialogs and you can get instant feedback on what you say with the app’s advanced speech recognition. Make learning English a sensational and exciting experience once you have tried out all of the above apps for yourself. Kendall Jenner is an English teacher at Dissertation Club Help. She is also a blogging enthusiast which enables her to share her thoughts on different areas of teaching profession.